Counsellors are recognised for providing a safe, confidential space to help individuals with any crisis they may face in their life. Emerging technologies are rapidly changing the face of counselling, especially with regard to the use of social media. Many amongst the counselling profession question whether social media can be used ethically, without ruining the therapeutic relationship between the client and counsellor. I believe there is a place for responsible social media use within counselling, but it is important to think about how we as counsellors, represent ourselves in the social media world. Confidentiality is paramount in the therapeutic relationship; our clients must be able to trust us and be assured that the information they give us will not be disclosed. Confidentiality is the corner stone of the British Association Counselling and Psychotherapy (BACP) Ethical framework, but perhaps the two principles that stand out for me are being trustworthy, and autonomy. A client needs to trust that I will not divulge any information disclosed within the therapeutic relationship via social media. For example, if a client discloses that they have money worries, I would not specify their user name in a tweet that may be of relevance to them. In order to protect a client’s autonomy, you need to explain the risk of commenting on Facebook or any other social media page. For example, if a client is following my Counselling Facebook page it is important to advise the client that they may be unwittingly exposing them self by commenting on something that is meant for public consumption. However, a client must retain the autonomy to act as they see fit. So how do counsellors maintain confidentiality and restrict any disclosure of confidential information in the social media world? I have devised a list of Social Media Rules for any counsellor to use when thinking or using social media. Never disclose any information about your clients on any social media forum. Never engage with a client on social media. Keep your professional and personal lives separate. Social media is public. Anyone can see it. Your relationship with your client is a professional one. You would not disclose your personal life in the counselling room so clients should not be able to see this information on the internet. For example, I have a business and a personal Facebook account. I do not accept any friend requests from anyone apart from friends or family on my personal Facebook account. My personal Facebook account is hidden from public view. If using anonymous testimonials on any social media sites ensure that you have the client’s written permission. Do not ask clients to write a review on LinkedIn or Facebook. Ensure you make clear that if they choose to that it may compromise their confidentiality and your counselling relationship. 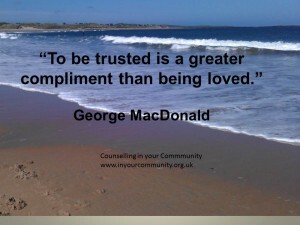 As a counsellor you will respect your client’s confidentiality. But how do counsellors ensure that our clients are clear about the use of social media, and its possible impact on the therapeutic relationship? You can help by having a social media policy. This will clearly state how you conduct yourself on twitter, Facebook, websites, blogs and LinkedIn, and more importantly, what you expect of the client. I have devised a social media policy which is available on my website and is referred to in my counselling contract. Do you recommend any other social media rules for counsellors or would anything else to my social media policy? This entry was posted in counsellor and tagged BACP, counselling, ethics on May 1, 2014 by Hazel Hill.